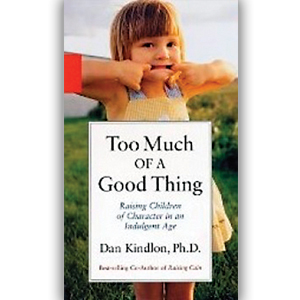 Raising children of character in an indulgent age can be difficult so Dan Kindlon, author of Too Much of a Good Thing, offers parents guidance not only on how to handle material indulgence but emotional as well. I’ve been wanting to read this book ever since I wrote the article “Your Child’s Happiness: What Price, Privilege?” for RFM’s November 2011 issue, as the title kept coming up in my research. I was intrigued by Kindlon’s claims that good intentions cause parents to negotiate and overprotect their children, giving them a sense of entitlement and a lack of limits. So in the spirit of giving my children the “love” they need this February, I decided to learn more about giving them less and expecting more. Kindlon explains we don’t need to compromise our close bond with our child in order to be able to impose the boundaries kids need. But we do need to stop doing so much for them so we don’t rob them of the chance to learn how to succeed on their own. “When a child has a reasonable chance to accomplish something, they should be encouraged because the skills they develop come to have their own incentive value,” Kindlon argues. The other part of the problem is that it’s easy for kids today to think of themselves as special because, Kindlon explains, “in many ways they are – they have special talents, abilities, and privileges.” Except when parents are so in love with their children that they can’t stand to see them upset so they give them whatever they want, Kindlon argues, “We end up making them feel that they’re at the center of all universes, not just our families.” This is how smart kids, born with all of the advantages, end up having no sense of self and feeling unable to measure up, Kindlon insists. While, Kindlon admits, there’s no one-size-fits-all solution that can be offered up here, if we maintain a critical eye of ourselves as parents it’ll be easier to us to help our kids grow to understand their responsibility towards others. Kindlon shares many anecdotes, in particular a great story about resisting the temptation to drive two hours home to get his daughter’s forgotten sneakers or buy a new pair before dropping her off at camp, that parents will really be able to relate to. In the meantime, encouraging chores, team sports, and community service are all ways to connect children to the world around them. So if you’re like Kindlon and feel you’re avoiding the mistakes your parents made but making new ones, then indulge yourself and check out Too Much of a Good Thing. I’ll blog about the rest of “The Seven ‘Deadly’ Syndromes” later this month so stay tuned for information on parenting in this age of indulgence.